Current owners bought Wigeon in 2004, completed a major re-fit on the boat, including the fitting of four new ribs plus strengthening strings to mid-ship section. The complete deck and hull was re-caulked using modern day marine sealants, the fitting of a Kubola boiler and complete wet central heating sealed system. All windows and windscreens fitted with double glazed and toughened units. The installation of 12 volt Waeco refrigerator and separate freezer. The vessel has a complete security system ,including surveillance camera's and Alarm. Aft cabin,forward cabin and deck saloon restored to original condition,including the fitting of new shower ,electric toilet and wash hand basin. Complete handmade bespoke galley, to include 4plate induction hob, a Panasonic flatbed oven /microwave and Panasonic microwave/oven,stainless steel sink with hot and cold water,solid new mahogany floor and a hand-made cherry dining table. Adjacent to galley ,a wet room including shower, electric toilet,and stainless steel wash hand basin. Opposite wet-room an office with built in safe which leads to master cabin which includes a king size bed, built in wardrobes,underfloor heating at each side of bed,storage shelf and full length seating. All lower deck cabins and galley are insulated and finished in teak,mahogany and cherry wood. The forward cabin has built in leather seat complete with small library area. The galley and deck saloon dining areas are upholstered in top grade leather. The deck saloon has a 8foot by 3 foot original teak dining table and enjoys underfloor heating with a matrix fan,a built in bookcase with original leaded glass, and writing bureau. All interior wood work is teak with new mahogany floor. The forward deck has an extending teak dining table, with six teak reclining chairs complete with loose cushions. To the rear of the wheelhouse there is a built-in 3 person teak seat complete with shelter. Whilst the Boat was out of the water in Kerrera in the Boatshed, all works which were carried out to the finest specifications were overseen and inspected by Marine Surveyor who completed out of water survey. Replaced marine instruments including navigation equipment,radio and forward looking underwater sonar,wind indicator. This is a fine example of a gentleman’s Yacht Ideal for Live aboard or holiday retreat. She has an excellent pedigree and is much sort after. The owners have heaped a considerable sum of money and love care and attention on this vessel, as can be seen from the specification. Definitely worth coming to see , dont miss the opportunity to own this boat. 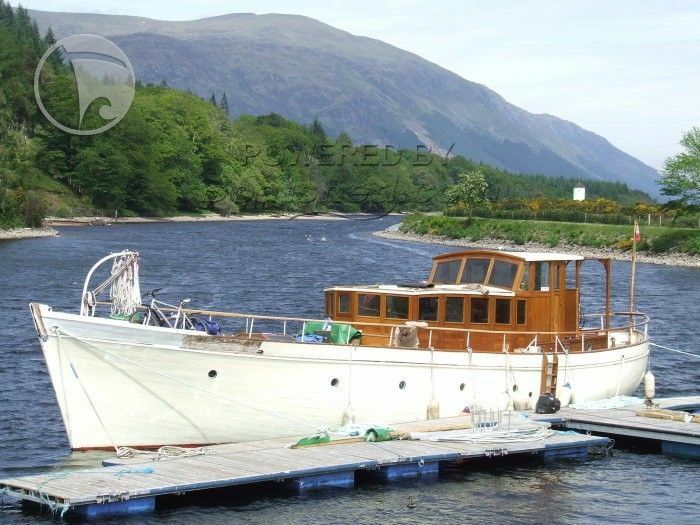 This Millars Of Fife Gentlemans Motor Yacht has been personally photographed and viewed by Edwin Malcoim of Boatshed Scotland. Click here for contact details. Please note this comments section is public. Please do not post your personal details here. To enquire about purchasing this boat, please contact the broker directly at edwinmalcolm@boatshedscotland.com. Please read our commenting guidelines before posting.